Okay, here’s the scoop on these. They’re soft and buttery and delicious. But not yeasty. Because they’re made of biscuit dough! Who knew, right? They’re also a major crowd pleaser. And they’re easy! The process is just like regular cinnamon rolls, except without all the waiting around while the dough rises. They’re totally manageable to make on a Saturday morning. 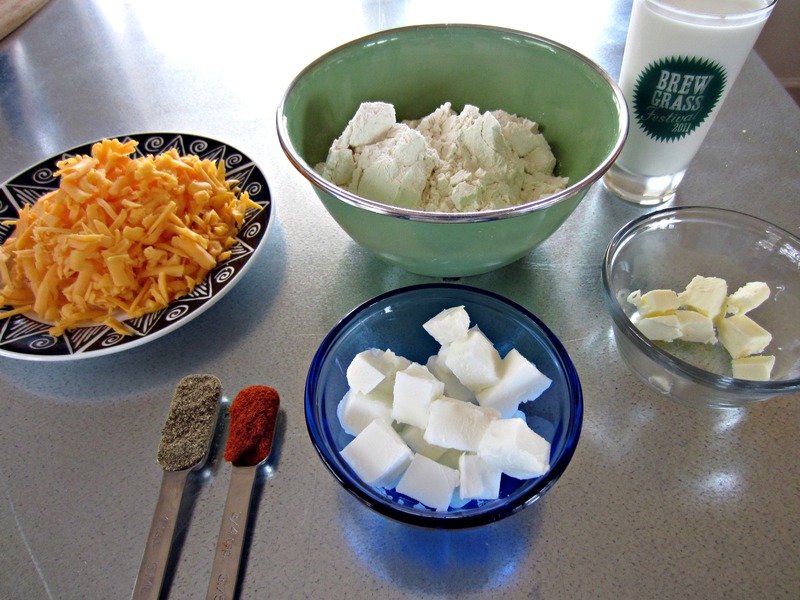 To make the biscuit dough, whisk together the flour, salt, and baking powder. 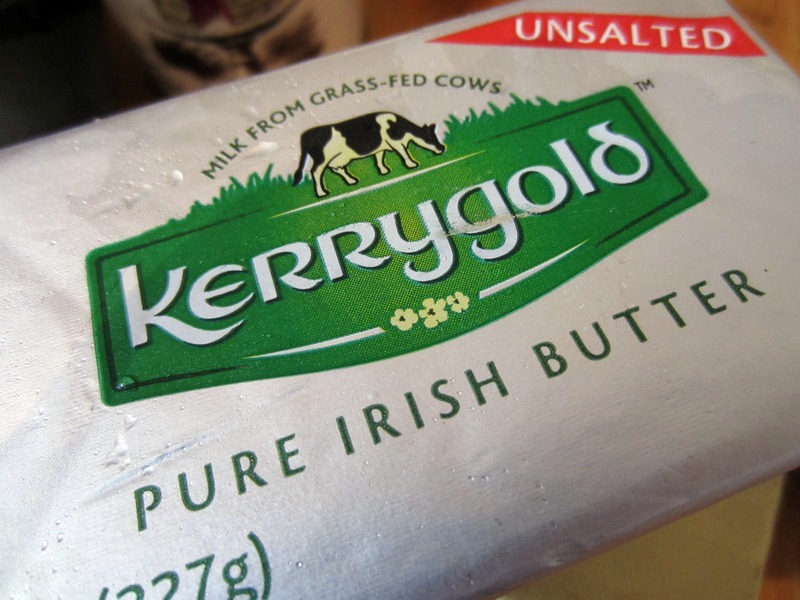 Then incorporate the shortening and the butter. 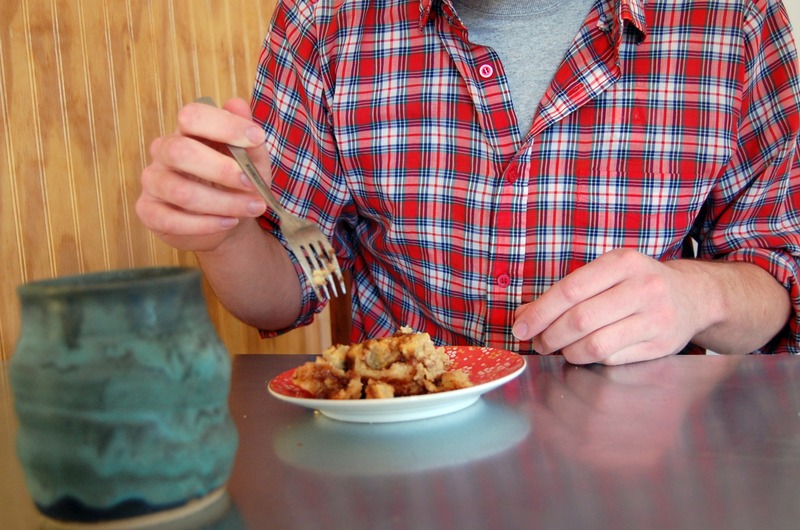 Use a fork against the side of the bowl to break up the fats. 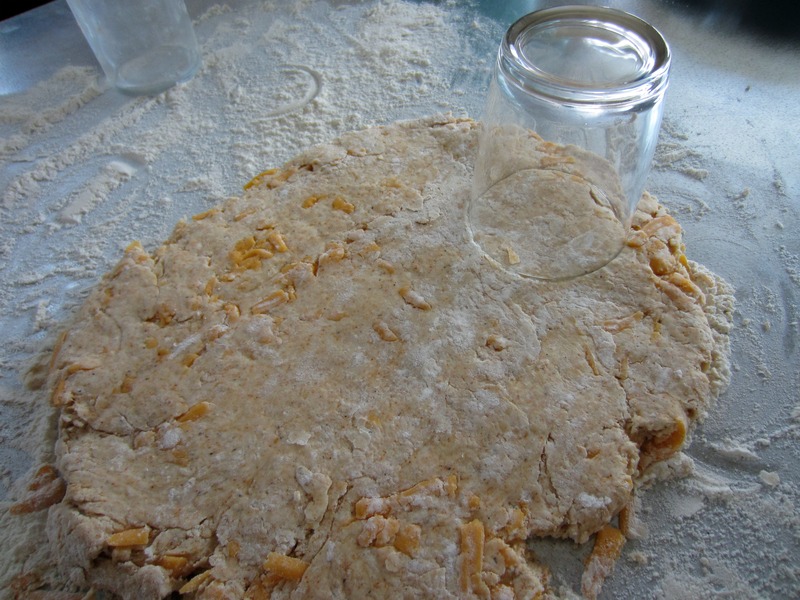 When the dough is crumbly (most pieces smaller than a pea), make a well in the center of the dough and pour in the milk. 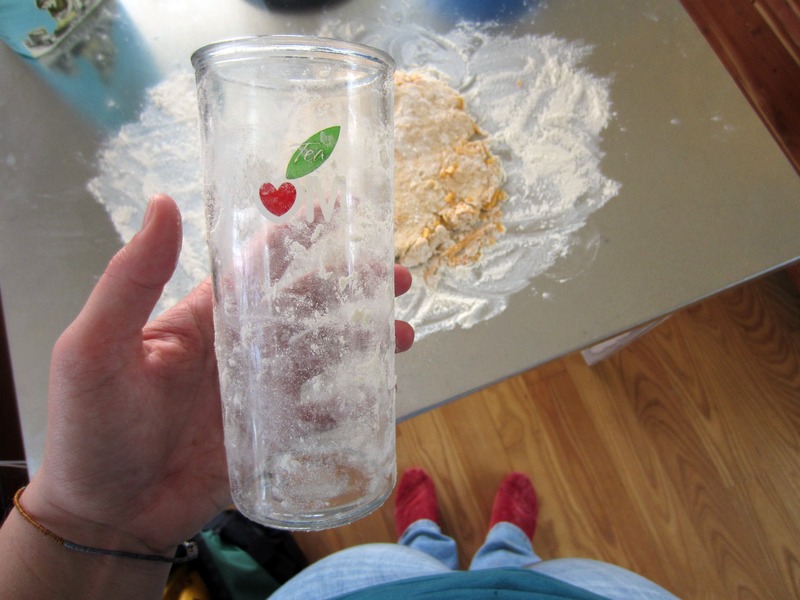 Use a fork to gently work the milk into the flour mixture. When the dough is shaggy and sticky, turn it out onto a well-floured surface. 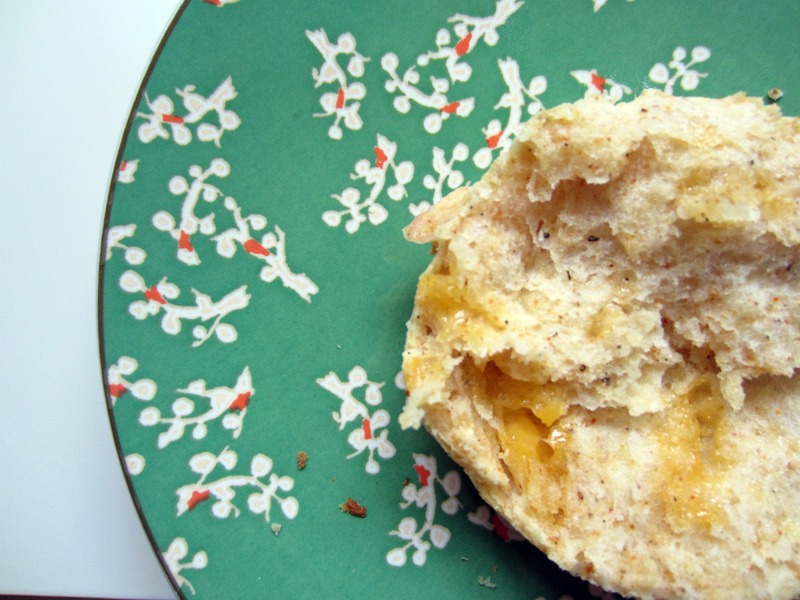 Knead the biscuit dough until it is more cooperative, but be sure not to over-knead. Then, roll out the dough. 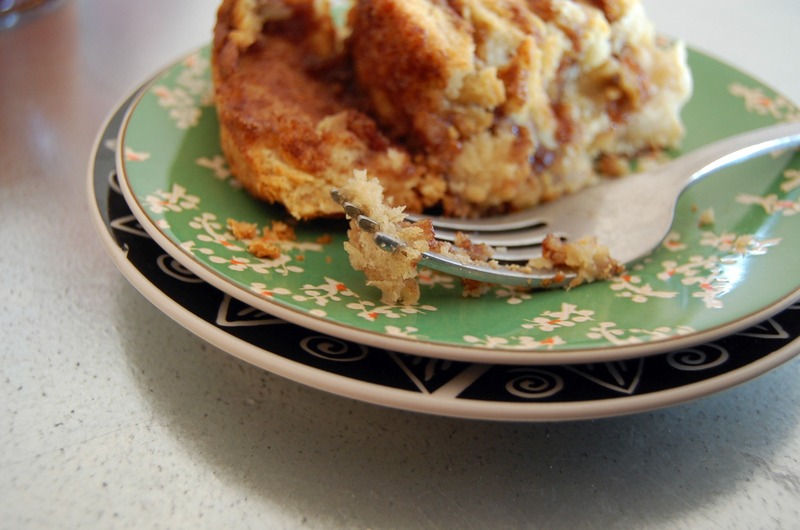 For cinnamon rolls, you’ll want the dough to be much thicker than it would be for plain biscuits. Also, you’ll want to make a sort of ovular shape with your dough. Next, spread the filling on top of the biscuit dough. Then, roll from the narrower end of your dough oval. 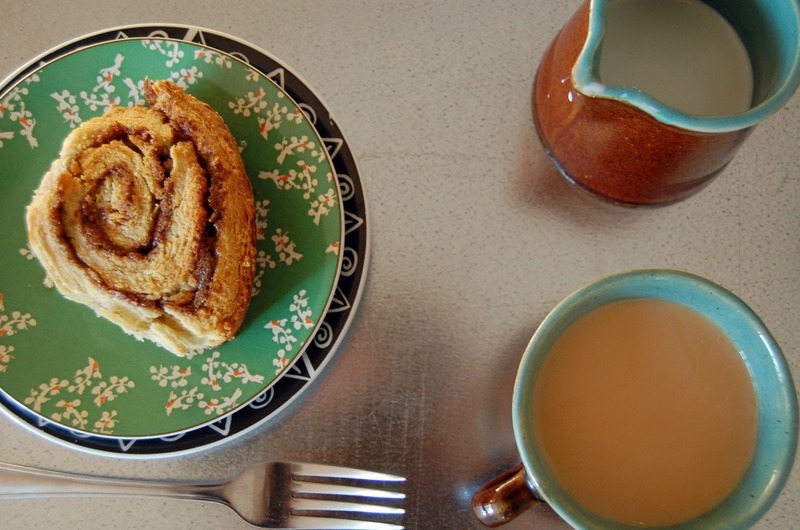 When you’re done, you’ll have a thick roll of cinnamony, biscuity goodness! This last part is tricky. 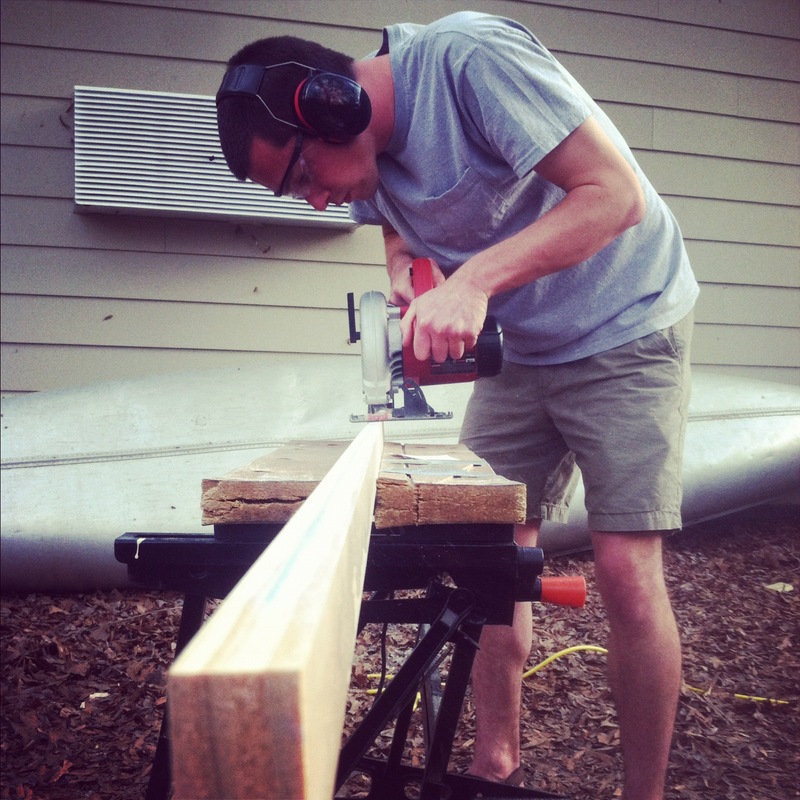 I dan’t often say this, but you’ll want to measure this part. With a ruler (or a tape measurer if you’re me), make a mark on the top of the dough roll about every inch. Then, using a sharp, sharp knife, cut ’em up! 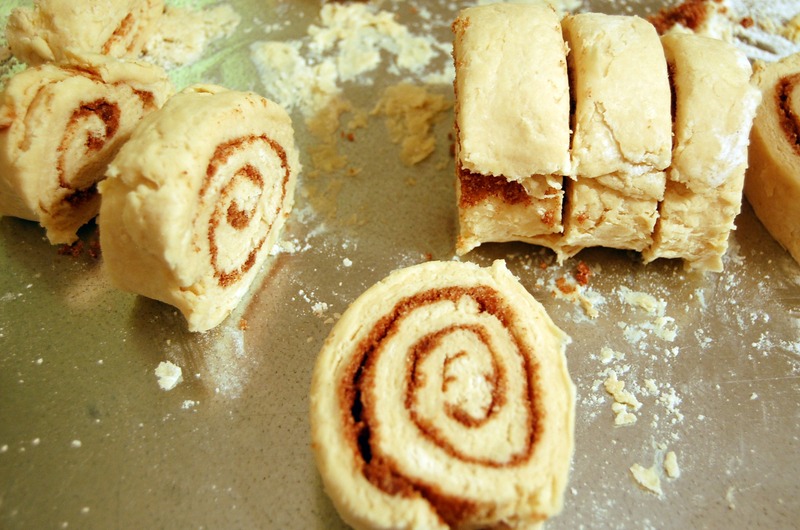 Place the rolls in a buttered and floured pan (I used a cake pan but I think a square brownie one would be best). Last, brush the tops with melted butter and bake for 25-30 minutes. You’ll know they’re done when your mouth is watering and they are golden brown on top. Best served with coffee and friends. There’s this episode of 30 Rock where Liz Lemon (recently dumped) decides that she’s totally giving up on life. She shows up to work wearing a fanny pack and a mom sweatshirt while carrying a cat named Emily Dickinson. Later in the episode, she opens a can of beenie-weenies and then pours pickles into the can. While pickled beenie-weenies sound decidedly disgusting, I understand the impulse to put pickles on any and everything. I also wholeheartedly love Liz Lemon as if she were a real person. If someone told me that I was just like her, I would act offended but secretly be flattered. Which is one of the reasons that I channel Liz Lemon whenever possible. That means I eat a lot of pickles. SInce I’m trying to make all my own pickles this year, this requires a large quantity of pickling spice. You can buy it from a health food store, but you sort of have to guess at what all is in it. And if there’s something you don’t like, you can’t really do anything about it. Ball also makes a pickling spice, but I think it’s a little chemical-y tasting. I didn’t realize, but it might be cheaper and easier to make your own. It’s just dill seed, mustard seed, black peppercorns, and crushed red pepper. Mix it all up! 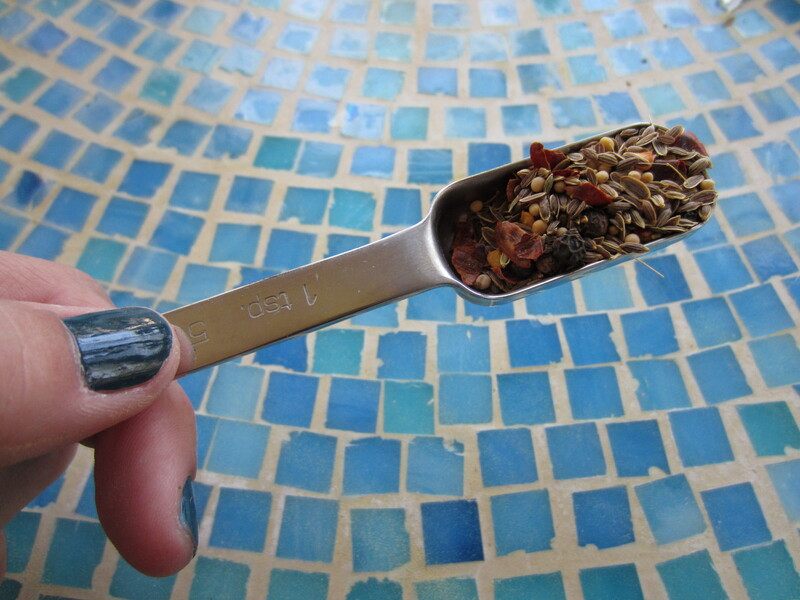 Put 1-2 teaspoons in each jar. P.S. This pickling spice can pickle all sorts of other things. Beets, okra, asparagus, green beans, baby onions… and whatever else you can think of. What I’m about to tell you might change your life. Are you ready? You don’t really have to buy pickles from the store. You can make your own. And I bet they will taste better. Sorry, Mount Olive. I think I’m a lot like an eighty year old person. This means several things, including my proclivity toward early bedtimes, the fact that I’m always cold, and that I sometimes get very sleepy after one glass of wine. However, some of my old person tendencies are more practical. I know how to knit. And sew things to other things. 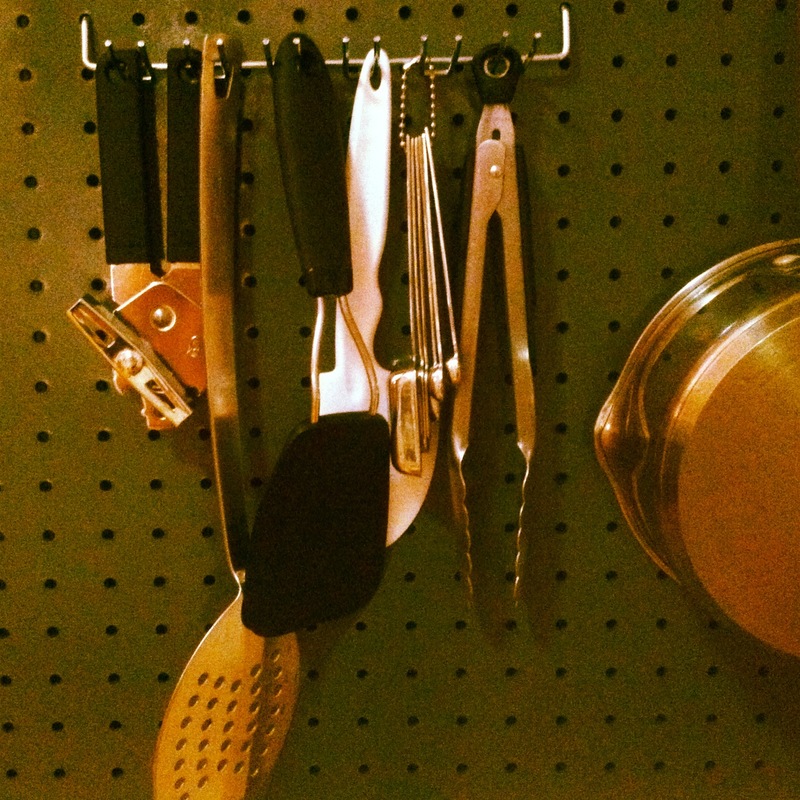 And I can put food up like a Cold War era housewife. Oh, peaches are in season, you say? I’ll just buy a bushel of them and seal them up in a nice light syrup. Never mind that I can buy a 75 cent can of peaches in light syrup any time of year. I want to be able to crack open a jar of peaches that I peeled, sliced, and packed any time of year. Maybe 2AM on Christmas Eve, because that’s the only time the grocery store isn’t open. That way I’ll feel like I did all that work for a reason. Aside from being fully prepared for the apocalypse, knowing how to put up food really impresses people who once canned food out of necessity. Jason’s grandmother gave me a bunch of her old canning jars, including this really neat one. In all seriousness, there’s really something to be said for canning your own food. Other than just looking neat, it’s pretty cool to open a jar of your own diced tomatoes in January. Even cooler if you grew them yourself. Who knows why, but there’s something appealing about working hard for something that you could buy at the store in a few seconds. There’s something poetic about canning food, maybe because it’s something that my great-grandmothers and grandmothers did out of necessity. Plus, I know what’s in it when I make it. I can’t pronounce what’s in a can of peaches in light syrup–other than peaches and light syrup. Enough about that. On to the important stuff. Pickles. These are a great basic pickle. Dill, good on sandwiches. 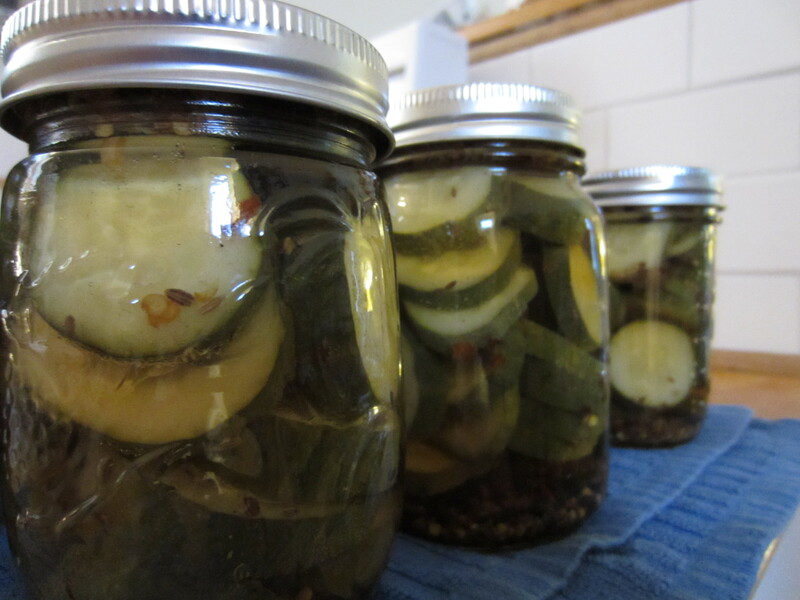 Pickling things is a good place to start as an amateur canner. They’re very easy. 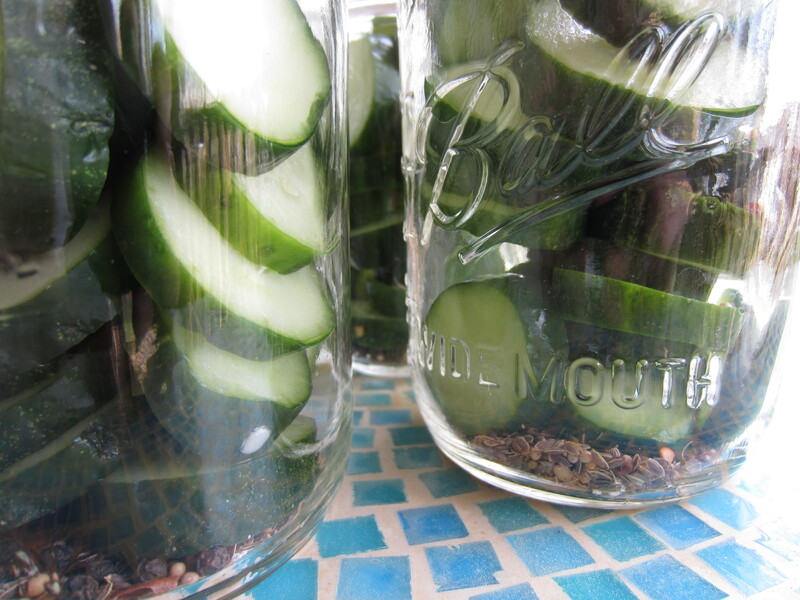 First, you’re going to need a bunch of pickling cucumbers. These came from Harris Teeter because I couldn’t wait for mine to grow. They’re still just little sprouts. Anyway, I bought ten of these and ended up with 6 jars of pickles. Be sure to cut off the blossom and stem ends. 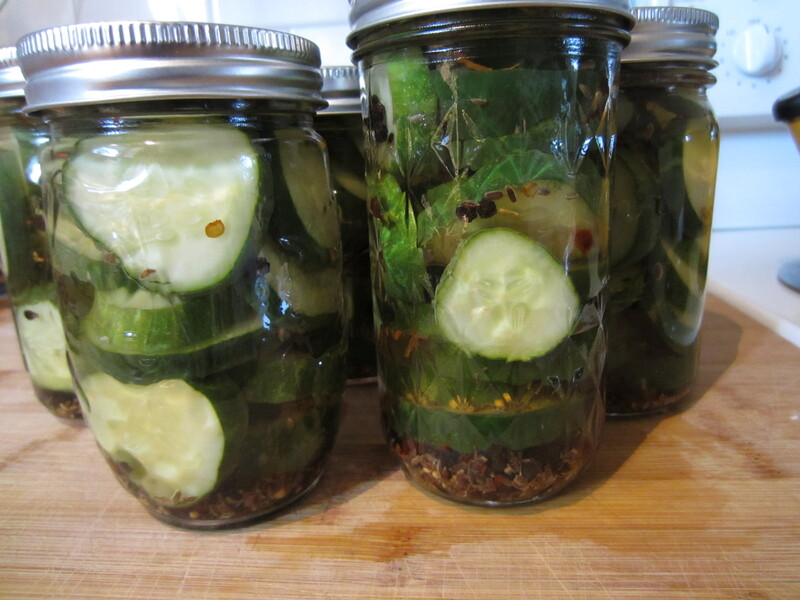 There are enzymes in them that will make your pickles soggy. No good. Cut ’em off. 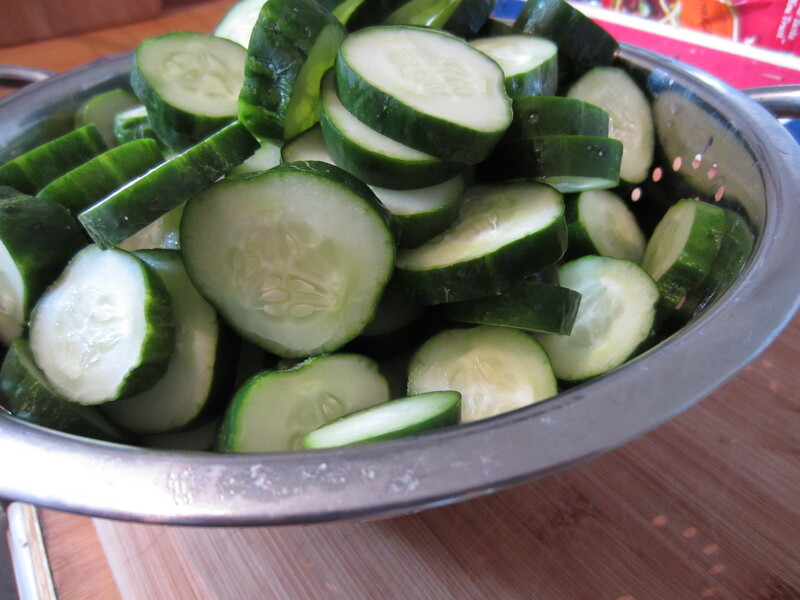 Cut the cucumbers into coins. And that’s all for cucumber prep. Okay, let’s talk jars. And sterilization. First of all: the basics. Jars you can use over and over until they crack. Bands (the part of the lid that you twist) you can also use forever. However, the lid you must replace every time because they only seal once. As for sterilizing, the best way to do this is to simmer your jars, bands, and lids before using them. 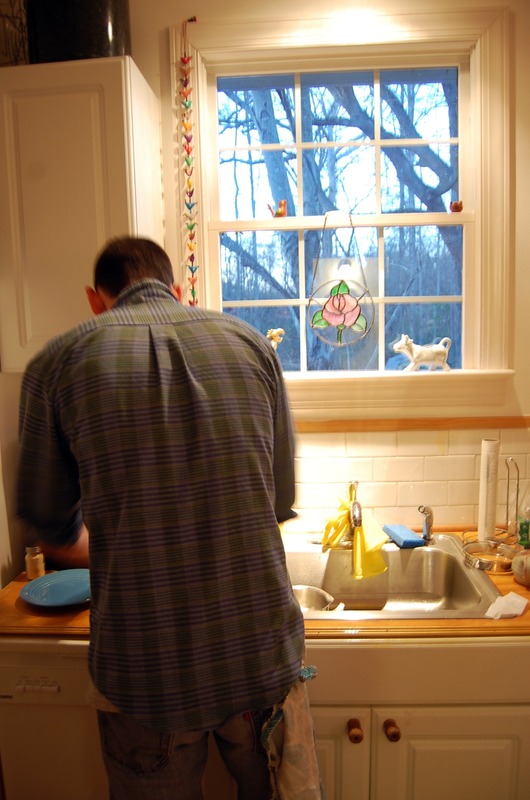 However, you can also use the dishwasher. Do bear in mind that you cannot touch the inside of the jar or the underside of the lid between the dishwasher and the boiling water canner. It’s up to you if you can handle that kind of risk. Botulism is no joke. Don’t let that scare you away from these pickles, just beware. Next, you pack your jars. Make sure that the jars are well-packed, but not stuffed. 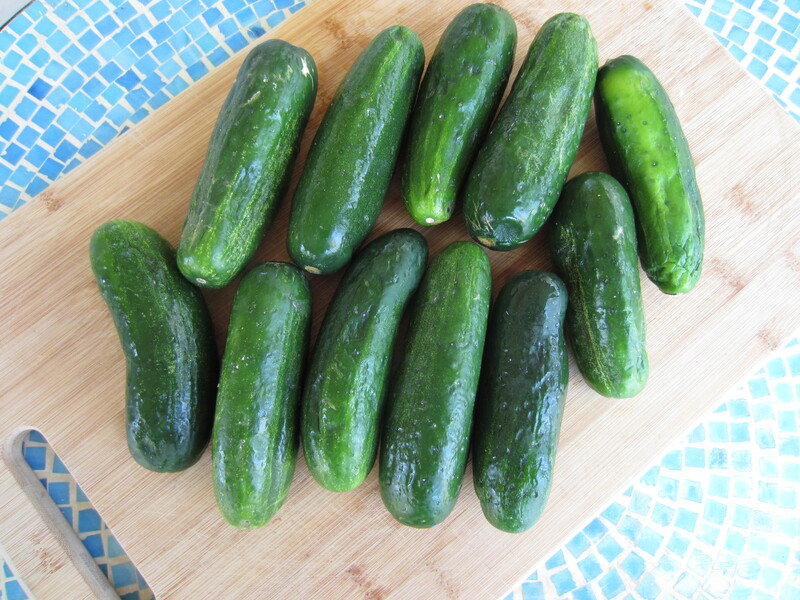 Avoid damaging the cucumbers. Also, throw in pickling spice and Ball Pickle Crisp. It’s a preservative that keeps things crispy. Not necessary, but extra crispiness insurance never hurt. 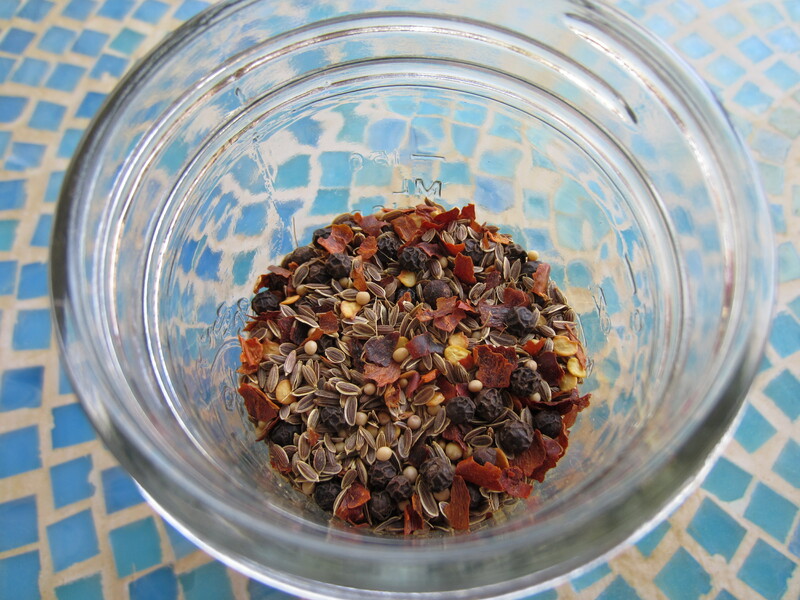 The pickling spice that I use is just dill seeds, red pepper flakes, whole mustard seed, and whole black peppercorns. To make the brine, bring water, apple cider vinegar, and pickling salt to a boil in a saucepan. As soon as all the salt is dissolved and the brine has boiled, fill your jars. Leave about a quarter inch of headspace. Place your lids on the jars and screw on the bands. Do not tighten all the way, only loosely. Now, the fun part! The last step is to process your jars for 10 minutes in a boiling water canner. This means submerge your jars in violently boiling water in a really big pot and leave them there for 10 minutes. That’s it! 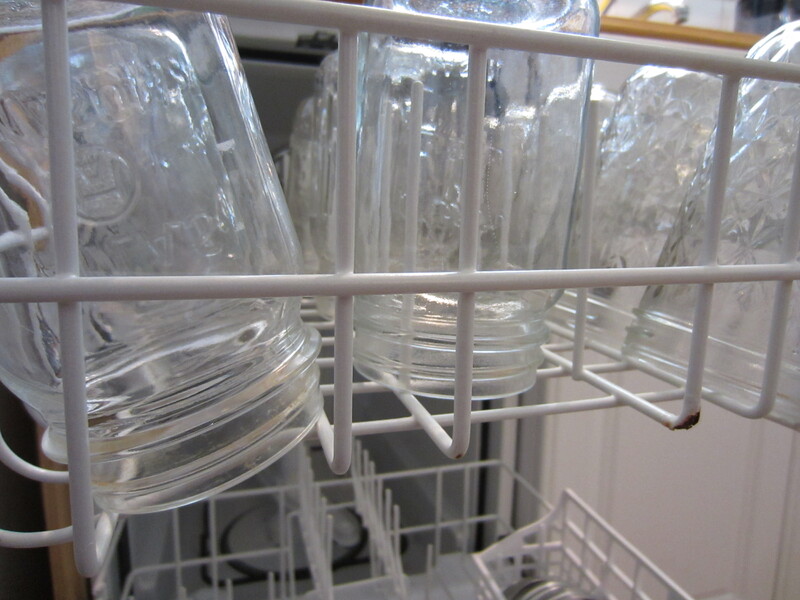 After processing for 10 minutes, place jars on a dishtowel and don’t mess with them. Just be quiet and wait for the most gratifying sound in the world. The jars will pop as they seal, and that sound will make you jump around in your kitchen. Trust. After 12 hours, unscrew the bands and pick up the jar by the edges of the lid. If it doesn’t open, you’re good! Store your jars in a cool, dark place. They’ll last for a year, but I always eat these pickles faster than that. Here is my last piece of advice: there is a lot of steam involved in this process so you’ll want to keep your hair out of your face. 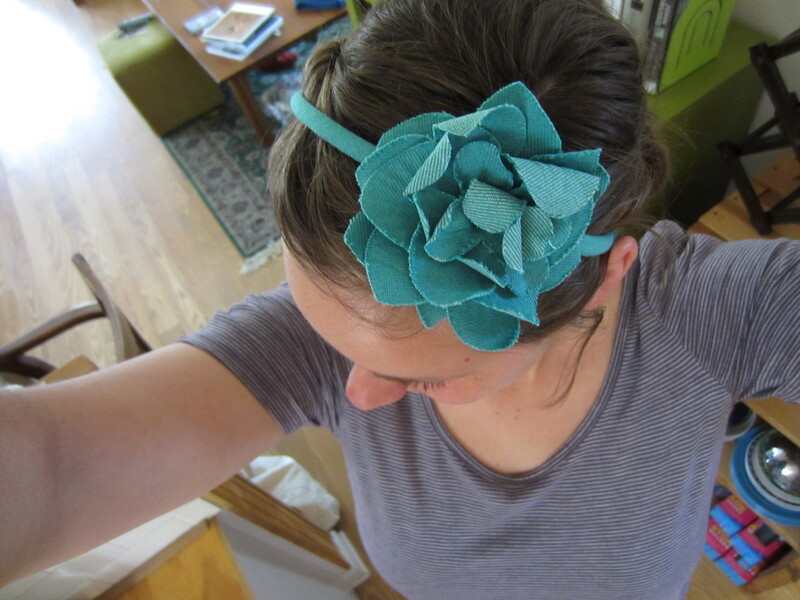 May I suggest a brightly colored headband with a large flower on it? 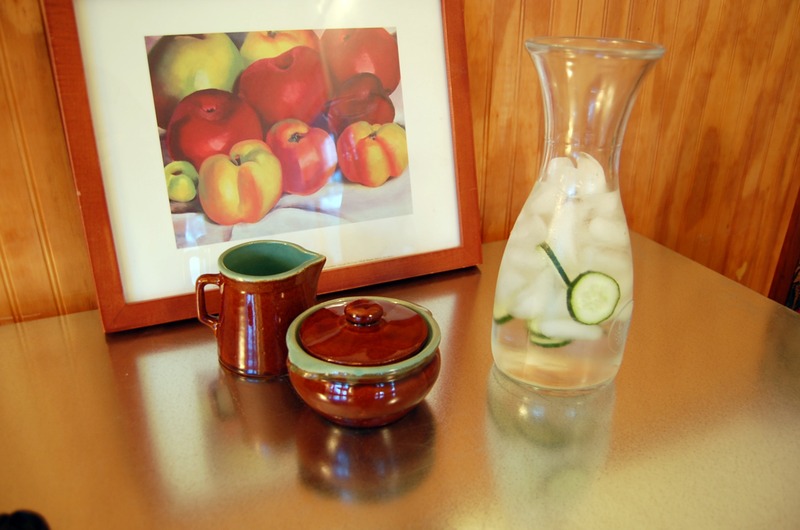 Simmer jars, lids, and bands or run them through the dishwasher to sterilize them. 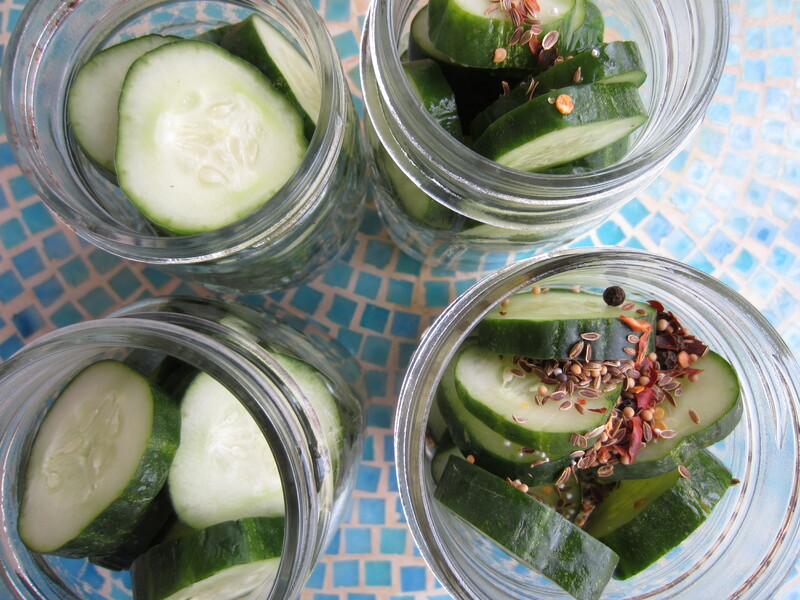 Remove the stem and blossom ends of your cucumbers and cut them into coins. 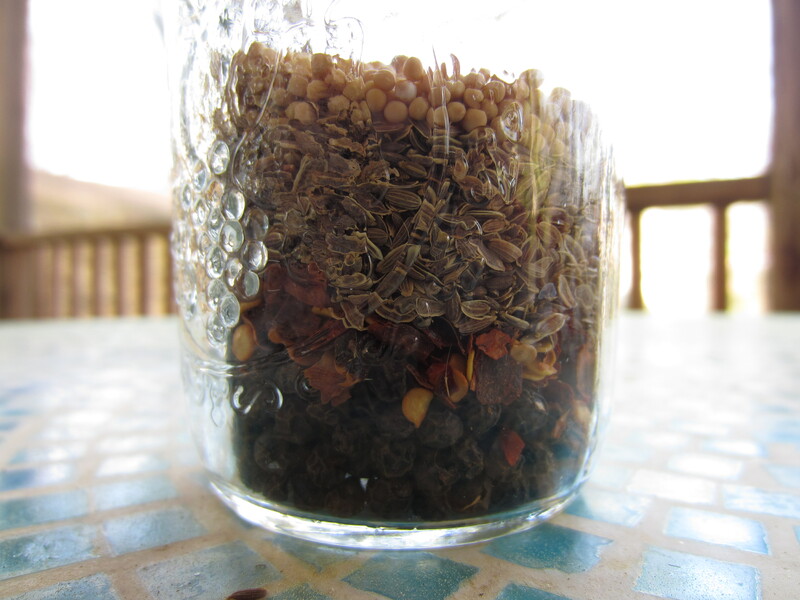 Combine mustard seeds, peppercorns, dill seeds, and red pepper, then put two teaspoons of the spice blend into each jar. Add about 1/16th-1/8 a teaspoon of Ball Pickle Crisp to each jar. Pack the cucumber coins in. To make the brine, bring salt, water, and vinegar to a boil. Pour the brine into the jars, leaving about a quarter inch of headspace. Place lids on top and gently screw on bands. Process jars in a boiling-water canner for ten minutes. P.S. 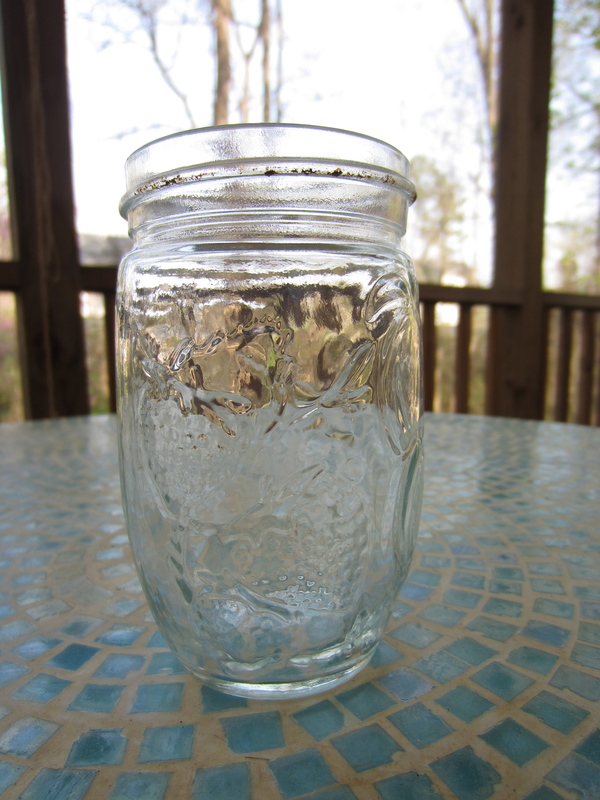 Read something authoritative about canning before you jump in. I have not covered all the things that you should probably know. I recommend the Ball Blue Book. It’s cheap and has all the answers. The first time I made this bread, I took it to Nashville when I went to visit family. The second time I made it, I took it to work. 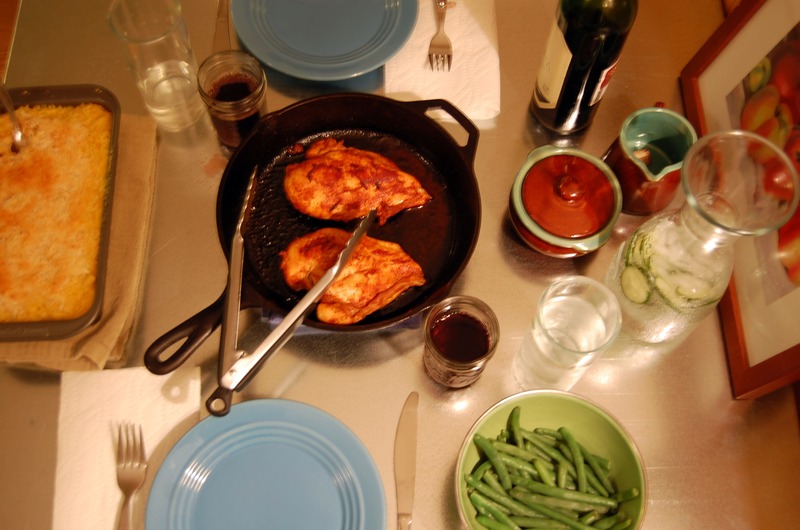 Here’s what I’ve decided: anything that involves browned butter must be shared. It’s just too good to keep to yourself. 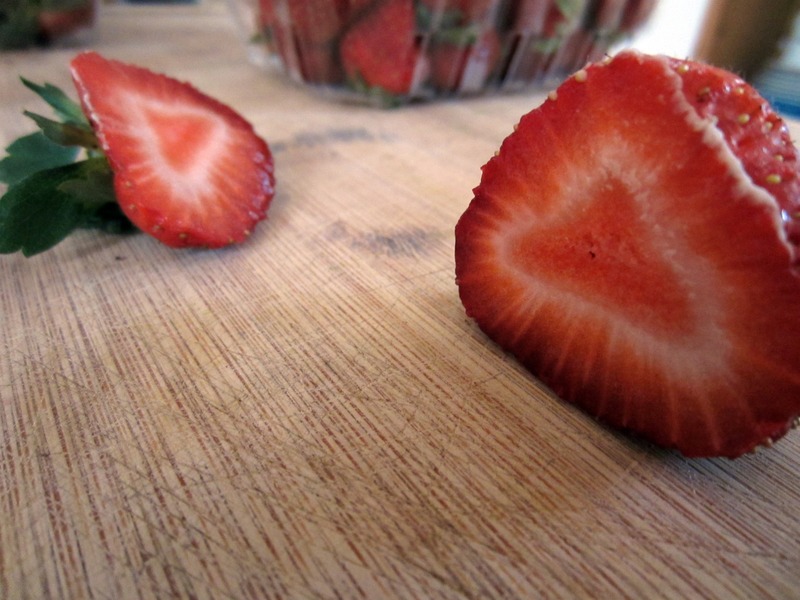 Coincidentally, I feel the same way about strawberries. 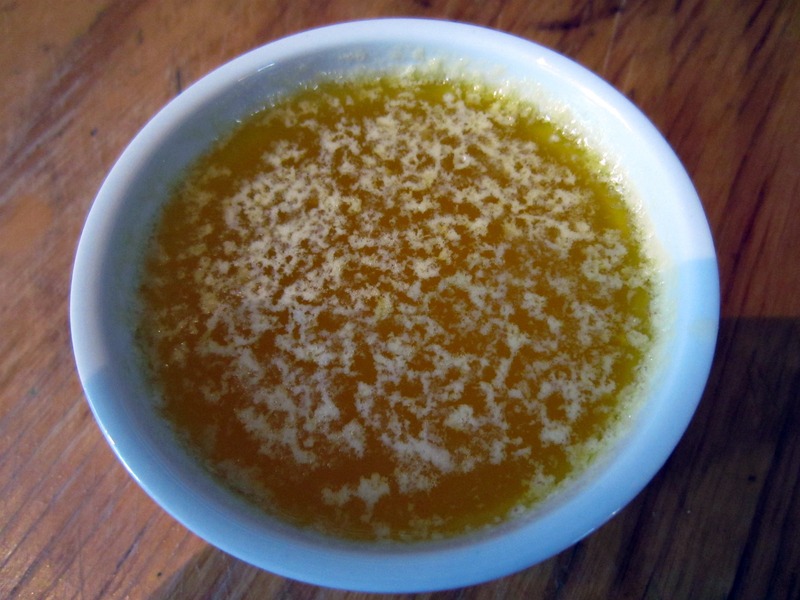 The first step in making browned butter is to eat a full meal. This reduces the possibility that you’ll casually ingest all of the product. Then, put the butter in a pan over medium heat and stir. That’s it. That’s all you do. The butter will foam and crackle, and then begin to smell nutty and darken in color. Bingo. 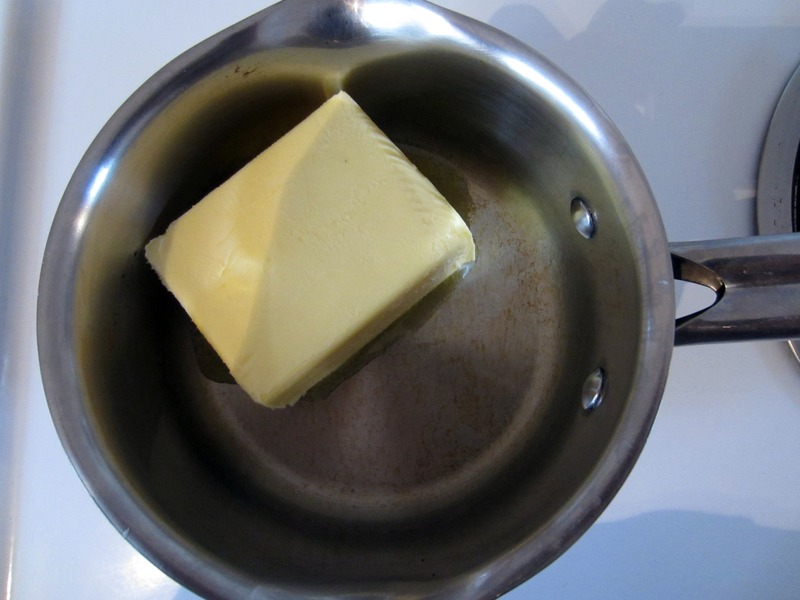 Immediately remove the butter from the pan so that it won’t burn. Once it’s off the heat, smell it. A lot. Try not to drool. Then, you just use it as your recipe calls for it. Just make sure it’s cooled a bit before incorporating. 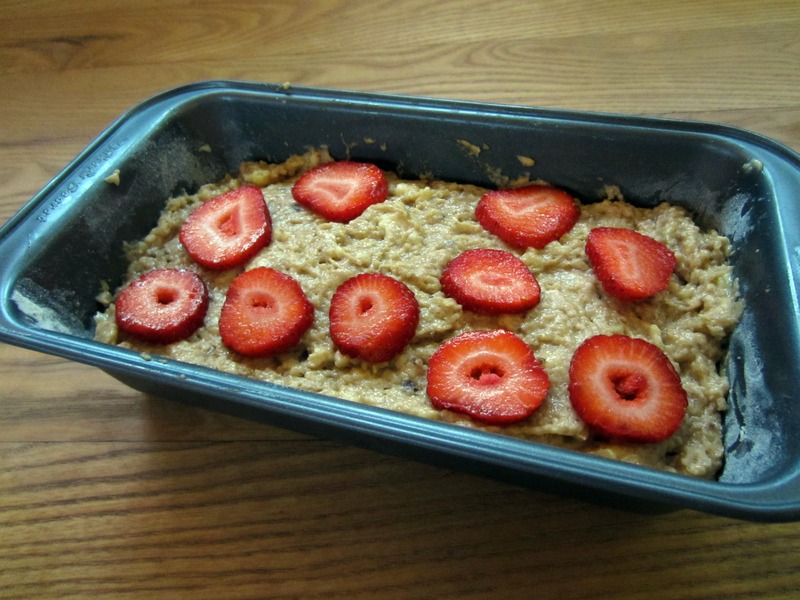 My favorite thing about this recipe are the pieces of minced strawberry that get baked into the bread. 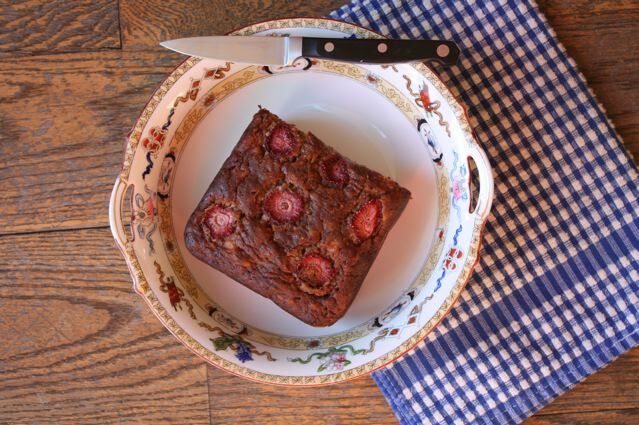 I mean, banana bread is already moist and delicious, but add little strawberry nuggets… it doesn’t get any better. Actually, I take that back. The thinly sliced strawberries on top are the best part. Preheat oven to 350 degrees F. Grease and flour a 9×5 inch loaf pan. Set it aside. Brown the butter, set it aside to cool. Whisk together flour, sugar, baking soda, and salt in a large mixing bowl. In another mixing bowl, whisk together eggs, buttermilk, yogurt, and vanilla, then incorporate the mashed bananas. Last, add the cooled brown butter. Incorporate wet ingredients into dry. 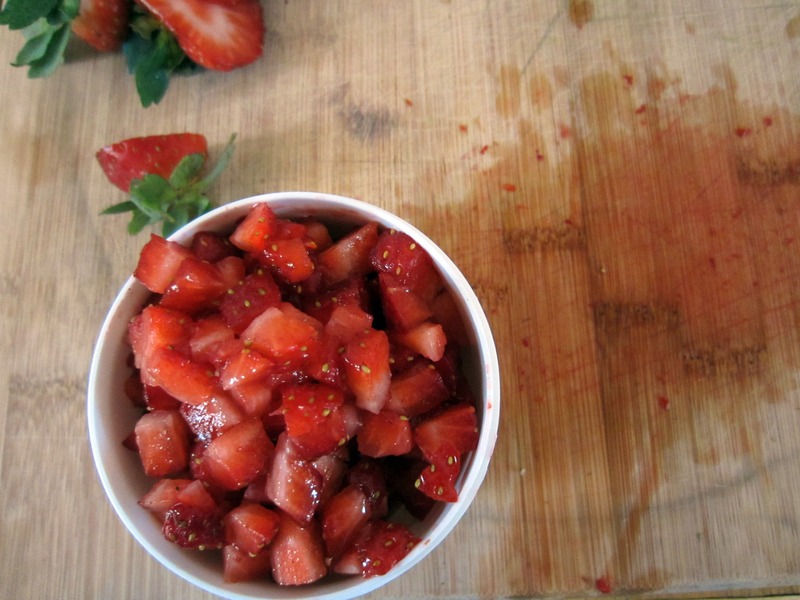 Fold in the diced strawberries. Careful not to over-work! 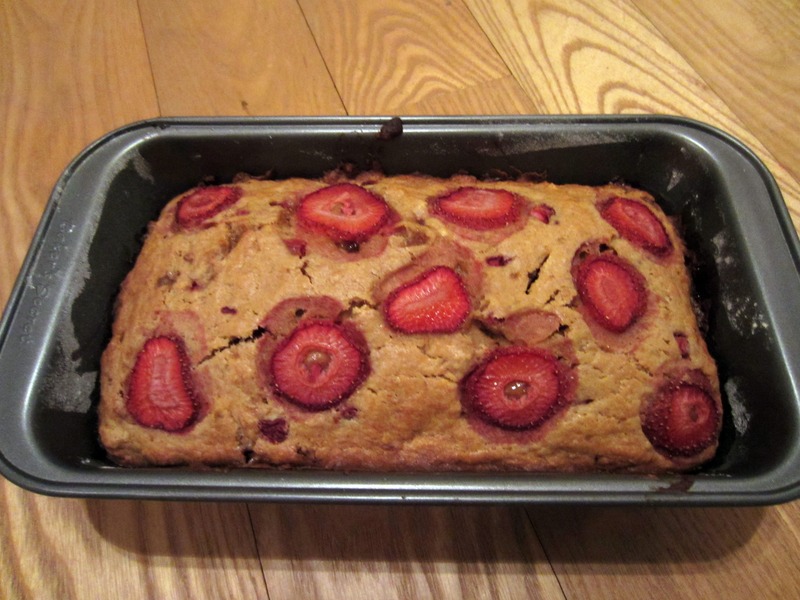 Pour the batter into the loaf pan, top with sliced strawberries, and place pan on a rack in the center of the oven. Bake for 50 minutes to 1 hour, or until an inserted toothpick comes out mostly clean. Let cool, then slice and share. Preferably with creamy coffee. In honor of my very favorite iPhone app, here is a weekend full of my Instagram photos. 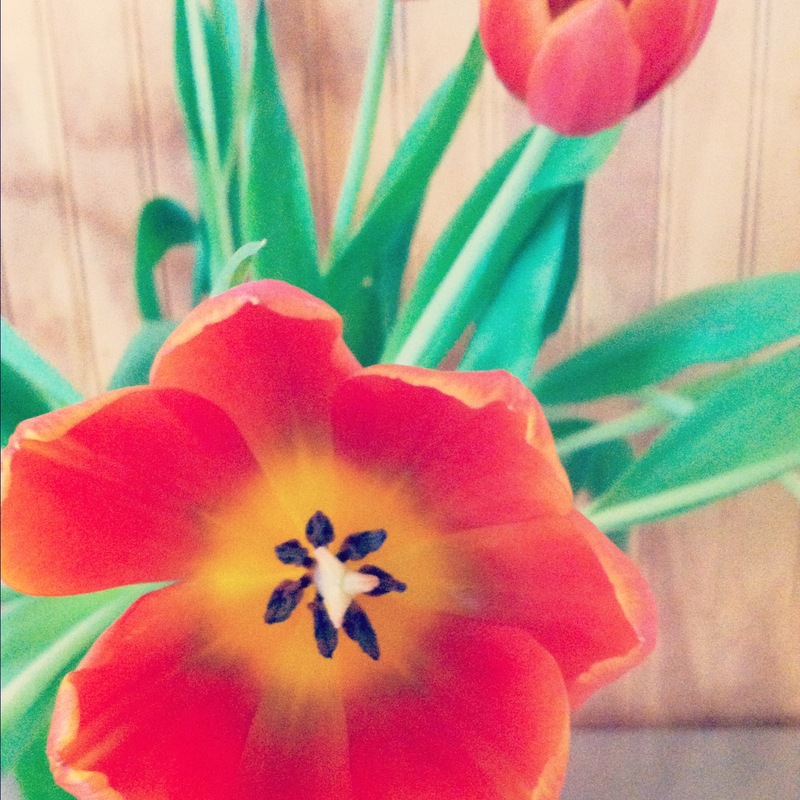 The greatest thing about being in Chapel Hill: Trader Joe’s has really pretty fresh flowers all the time. 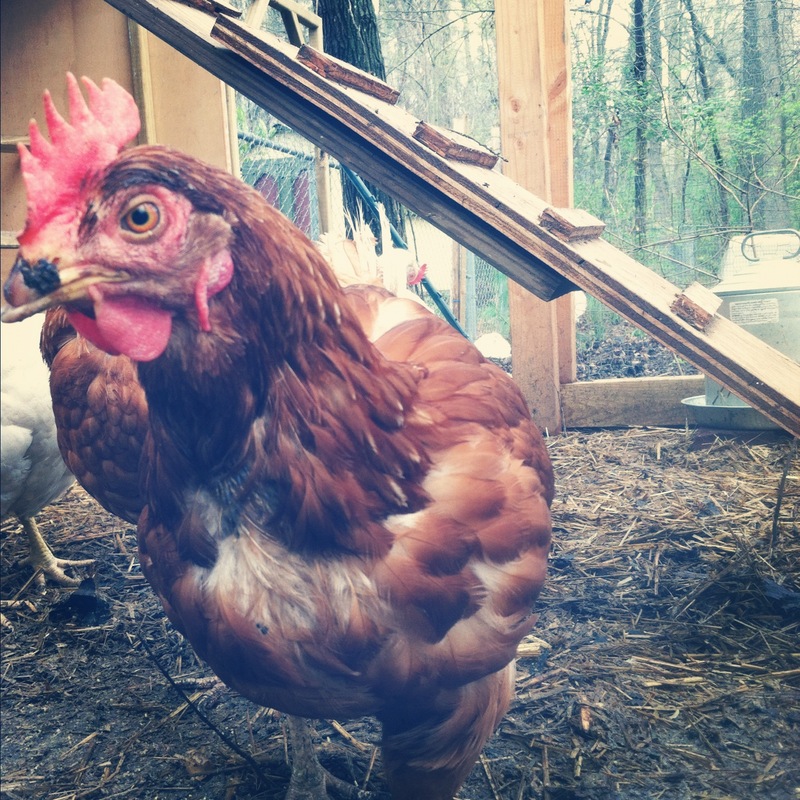 I keep talking about the chickens. So here’s one of them. I made saffron rice for dinner tonight. I just love saffron threads. Our seeds are sprouting! 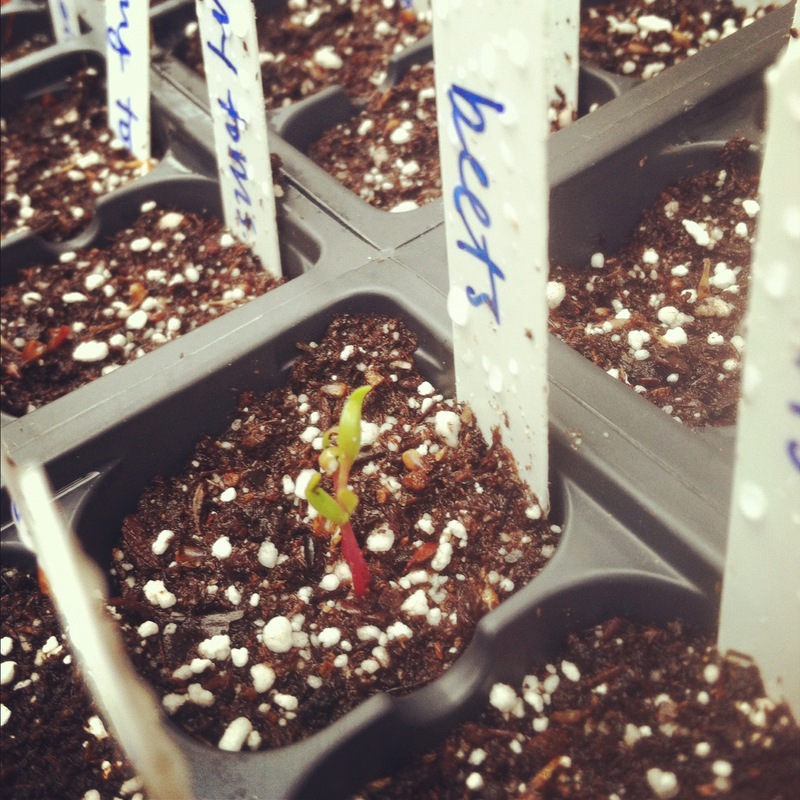 Here are the beets, about which I am the very most excited. 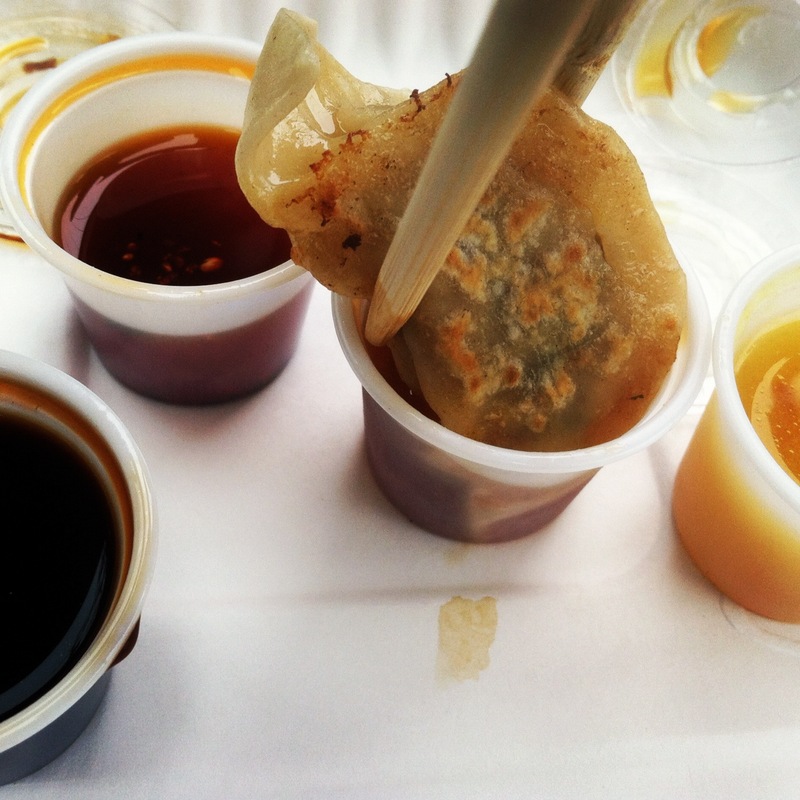 We went to the Chirba Chirba Dumpling food truck in Carrboro this weekend, it was way good. They have four different dipping sauces! Okay, these are mostly from this week at work. But it counts. 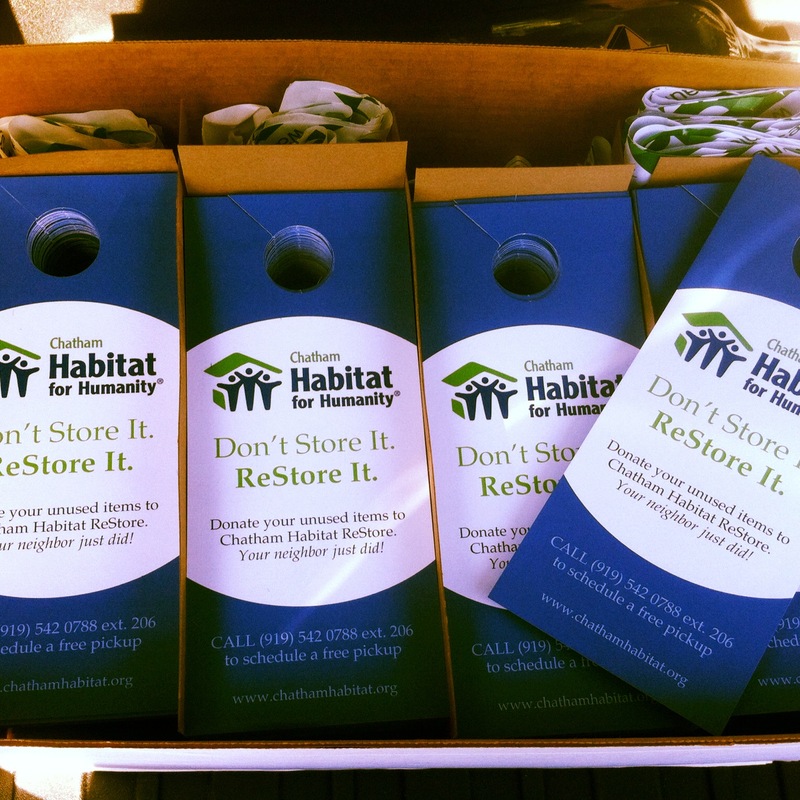 I designed these door hangers, and then had 4,000 of them printed. Aside from the sleep that I lost over the thought of incorrect phone numbers, they are perfect! Jason got a new car! 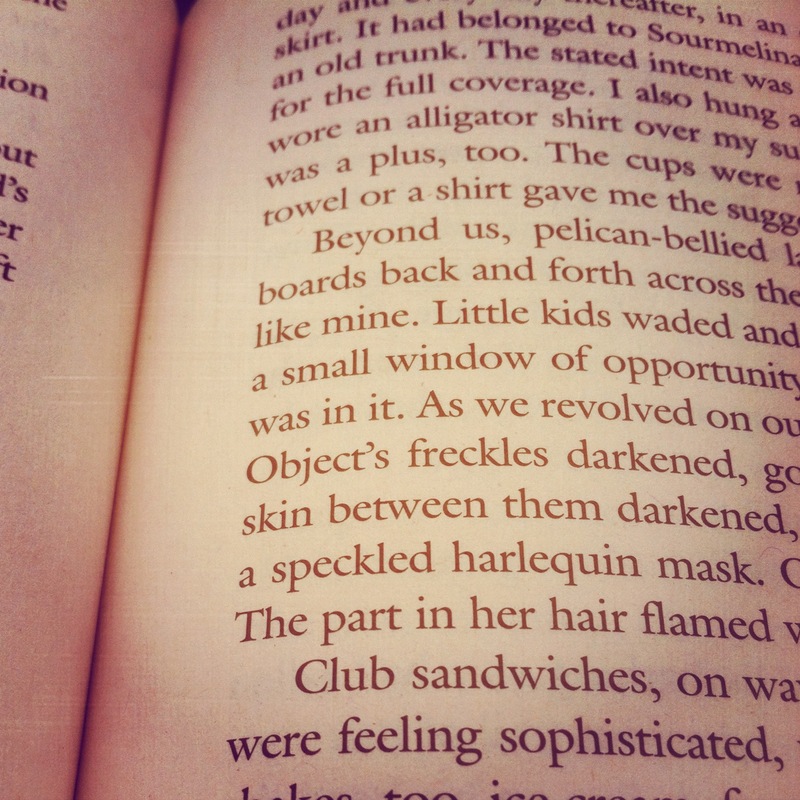 I’m reading Middlesex by Jeffery Eugenides, and I love it. Jason and I spent the weekend on a project. Here he’s demonstrating proper safety procedure. 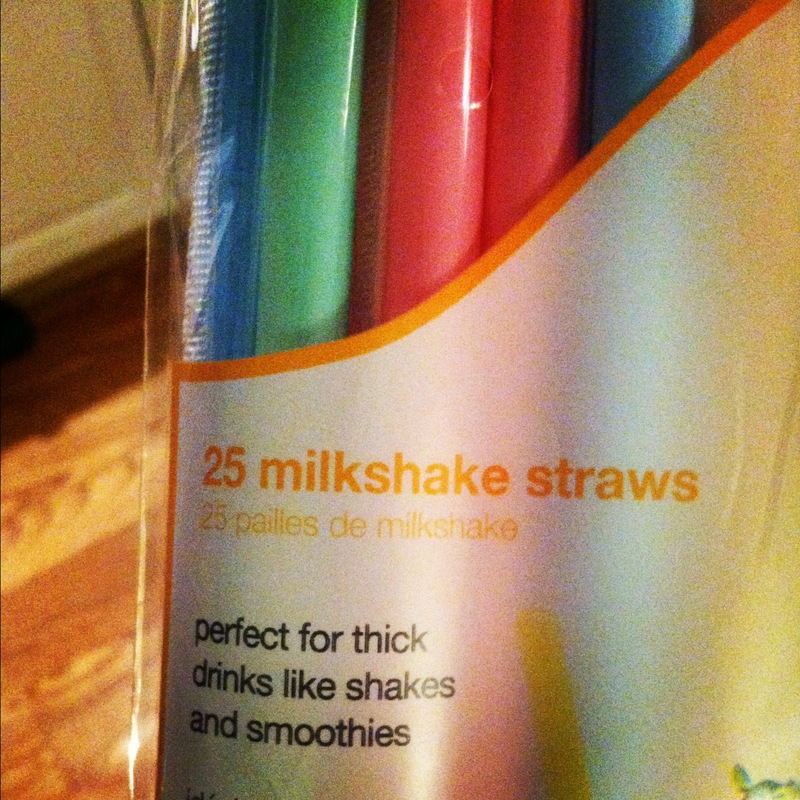 I found these straws for smoothies at Harris Teeter! They’re extra wide and sturdy. 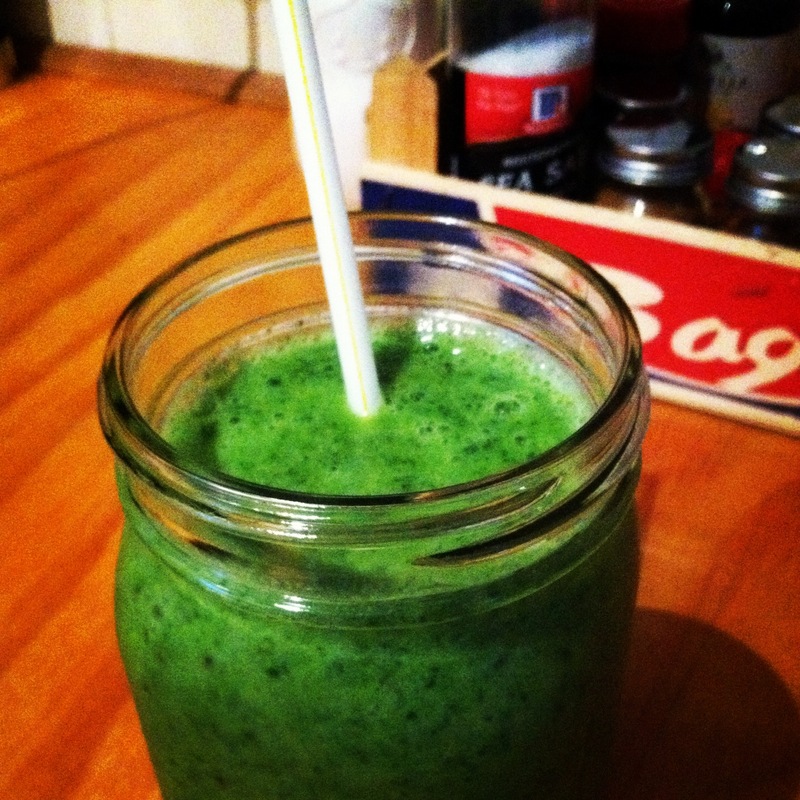 Speaking of smoothies, here is a delicious green one. 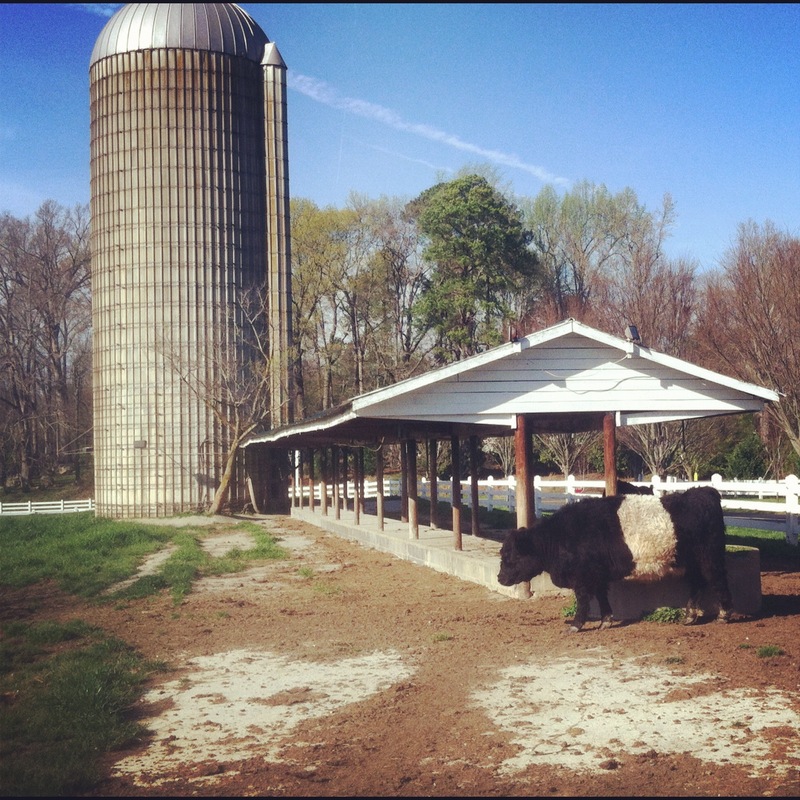 Belted Galloway cows at Fearrington Village in Chatham County. They’re very cute and furry. 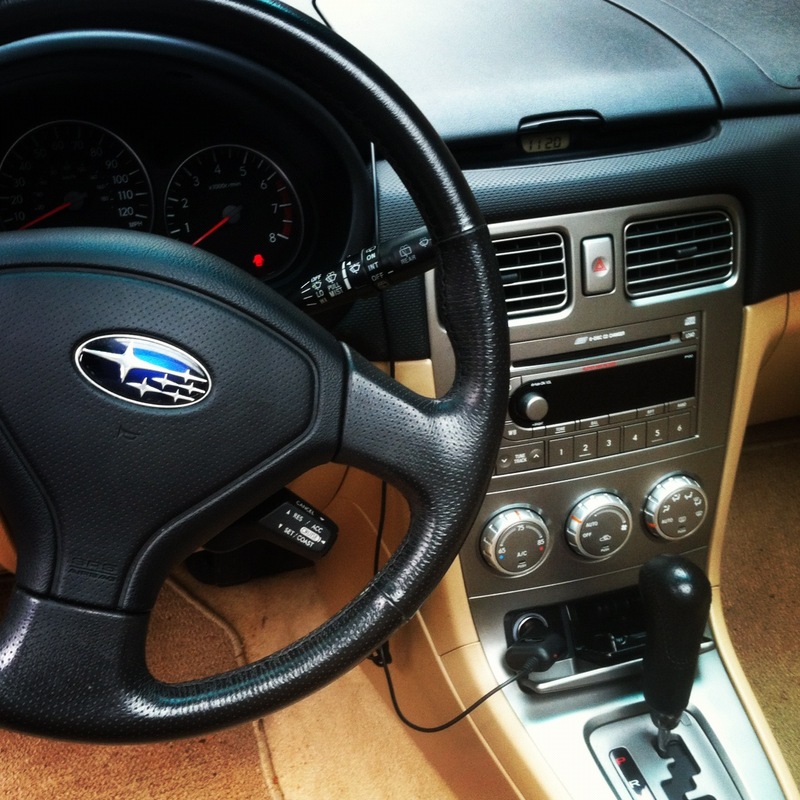 Here’s a sneak peek at the project that Jason and I did this weekend. 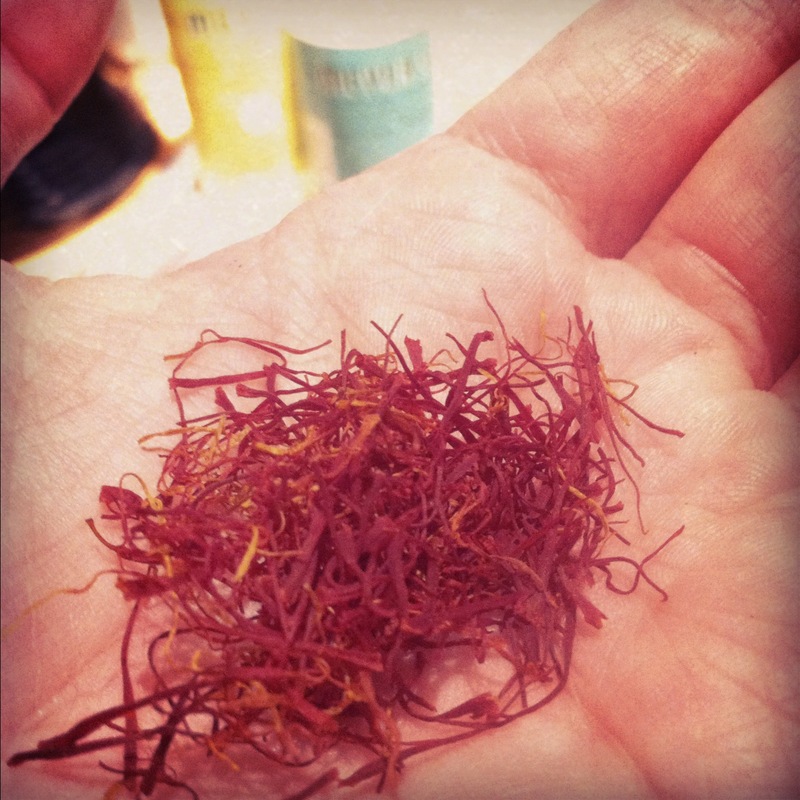 A hint: it may have been inspired by Julia Child’s kitchen, and it might involve a shade of yellow that’s called called “saffron thread,” which may have inspired the saffron rice that I made for dinner tonight. The Carrboro Farmer’s Market provided some serious jar label inspiration. 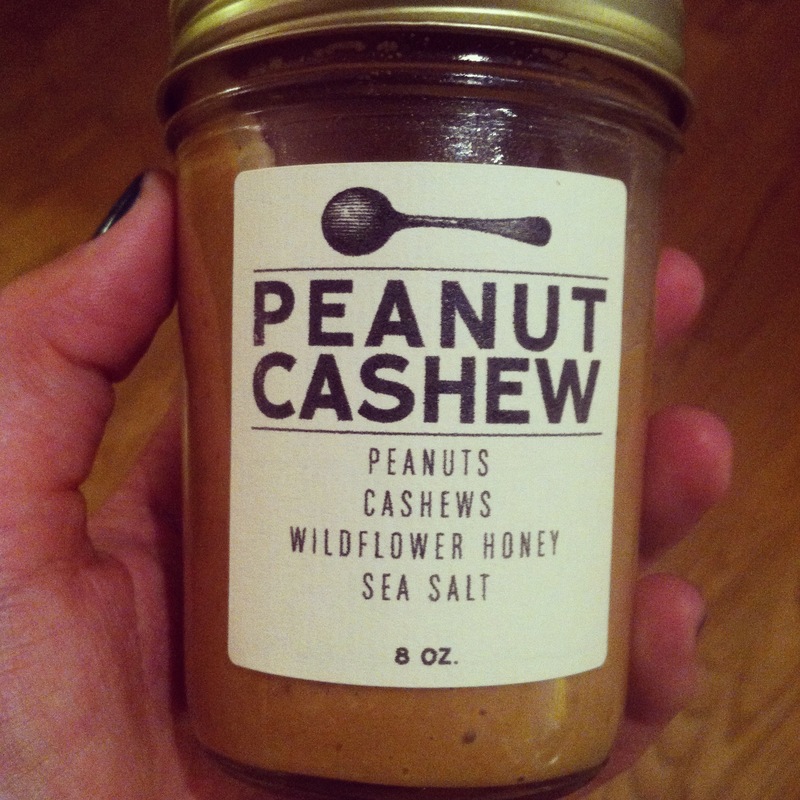 And a delicious nut butter. Hope your weekend was as photo-worthy as mine. Happy Instgramming! I feel like cheese is never a bad addition to anything. In this case, biscuits! I use a pretty basic recipe for biscuits. It’s on the back of the Clabber Girl baking soda canister. It’s just baking soda, all purpose flour, salt, buttermilk, Crisco, and butter. Then you can add anything you like. Or not; there’s nothing like a hot, buttery plain ol’ biscuit. Today, I just added grated cheddar cheese, black pepper, and cayenne pepper. 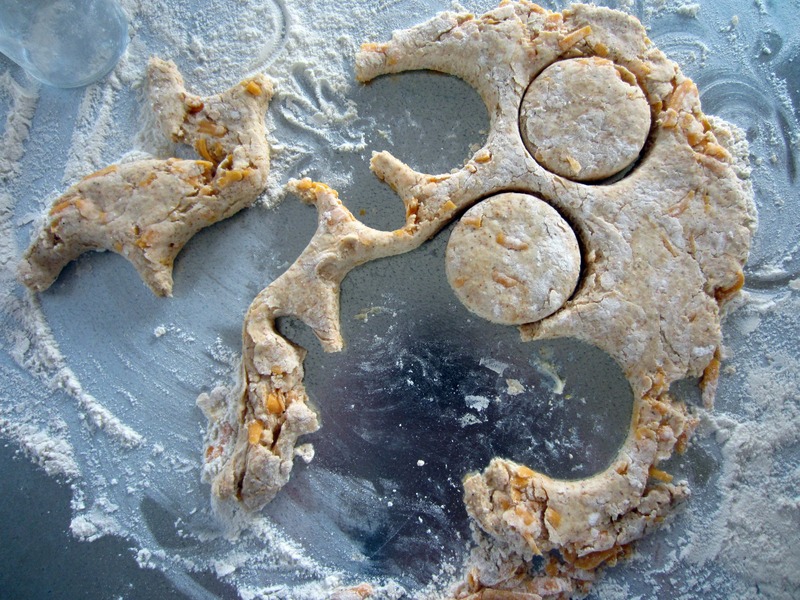 It seems like there are a bunch of things that you need to make biscuits, like a dough incorporating tool of some sort, or a biscuit cutter. Nonsense, I say! I don’t even have a rolling pin! Instead, I used a tall glass. One of those old POM juice glasses. As soon as this company stopped selling their juice in these glasses, they became a hot commodity. Shout out to the wonderful Jennie Burrowes for giving me this one! It doubles as an excellent rolling pin. Who knew? You could use pretty much anything tall and straight. And round. Duh. As far as cutting goes, choose any glass that is the size you’d like your biscuits to be. Easy peasy. As for breaking up the fats into the flour, it’s as simple as a fork against the side of the bowl. This is my favorite part. I just love biscuit dough. 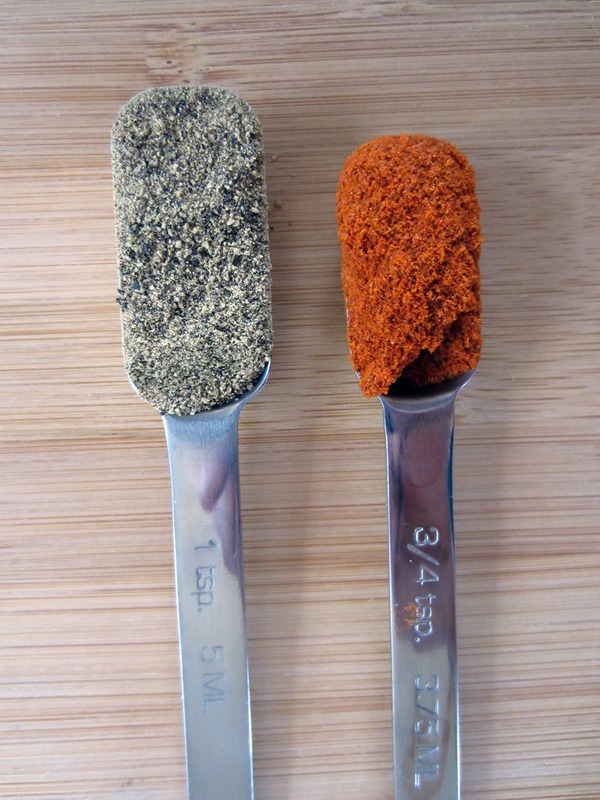 First, whisk together the flour, salt, baking powder, cayenne pepper, and black pepper. Then, using your fancy dough incorporating tool (or a fork), incorporate the shortening and butter. Work it until there are mostly just pea-sized lumps and some flakes. Then, make a well in the center of the mixture and pour in the buttermilk. Incorporate gently with a fork until all the flour is wet. Turn the shaggy dough out onto a well-floured surface, and knead a few times to smooth things out. 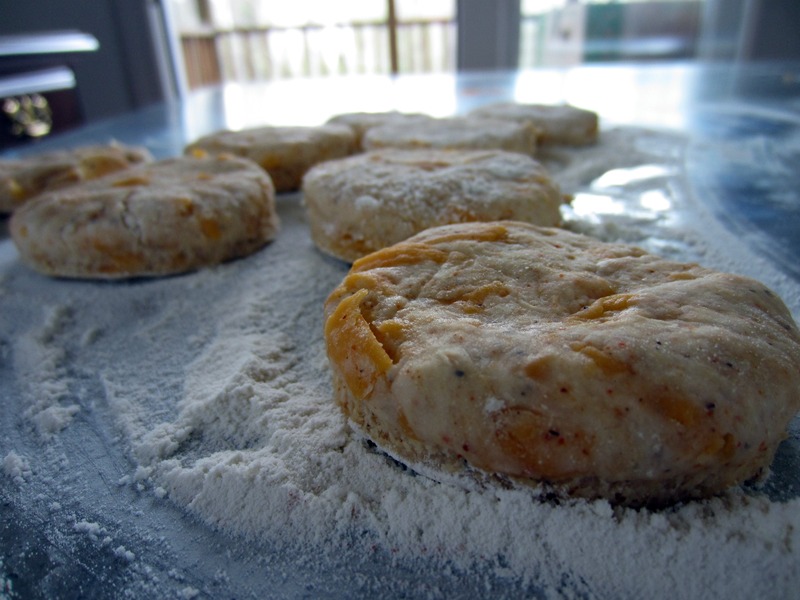 Roll out the dough (about an inch thick) and cut out your biscuits. Bake for 11-15 minutes in a 475 degree oven. 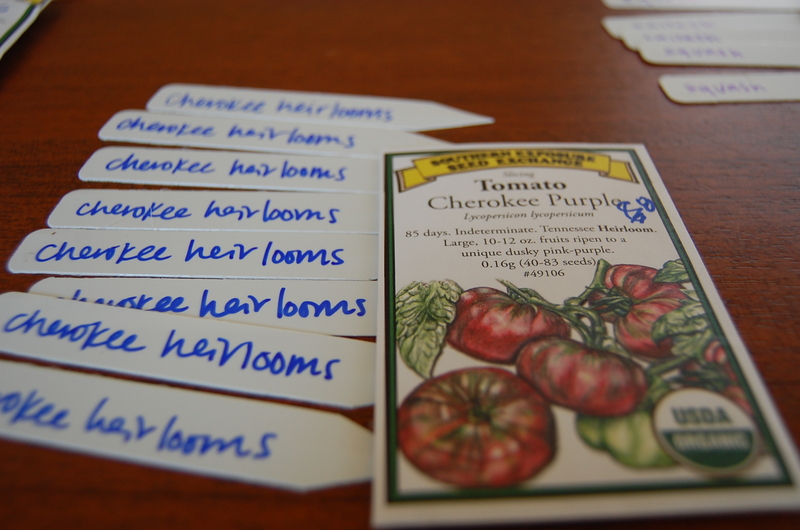 Today feels like an appropriate day to have planted a bunch of seeds. It was light out until, like, 7:30 or something crazy. We spent the whole afternoon outside putting up a mailbox at our new house, and I got this weird tan line from my shirt. It felt like spring. 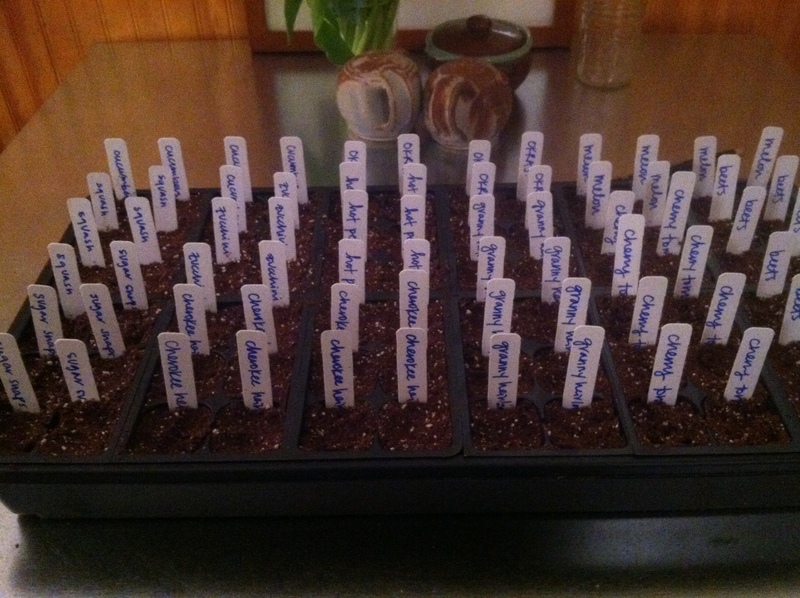 We planted a lot of seeds, and some of them will hopefully turn into plants! Here’s this year’s line up: sugar snap peas, yellow crookneck squash, cucumbers, dark green zucchini, habanero peppers, okra, cherokee purple heirloom tomatoes, Granny Cantrell heirloom tomatoes, Matt’s wild cherry tomatoes, sharlyn mellons (close to honeydew), dolce de chioggia beets, cilantro, dill, basil, and chives. Granted, some of these may not sprout. Or they might die somewhere in between sprouting and bearing fruit. There’s something really remarkable about eventually coaxing food out of a little tiny seed. I’m excited about this year’s prospects. Last year I moved in the middle of the summer, and I bought my plants as starters. This year, it’s all up to me to make it work. 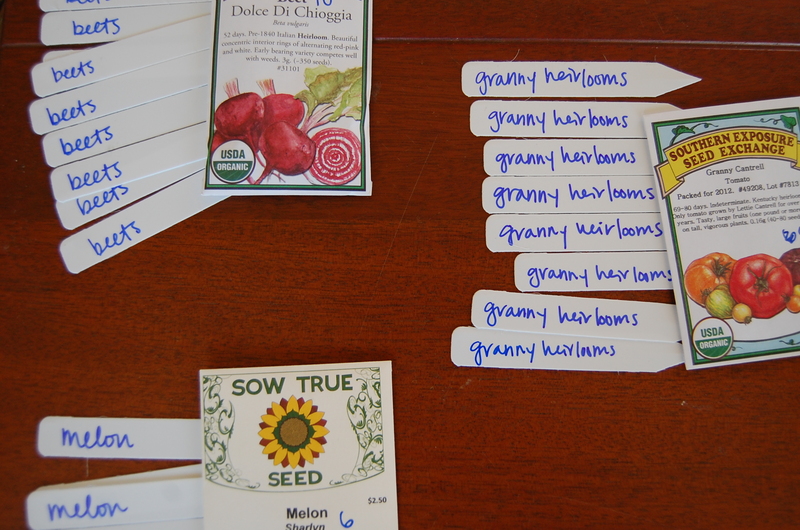 It’s also kind of amazing how cheap all these seeds were, especially considering how much veggies cost at the grocery. It certainly takes less effort to buy a cucumber. 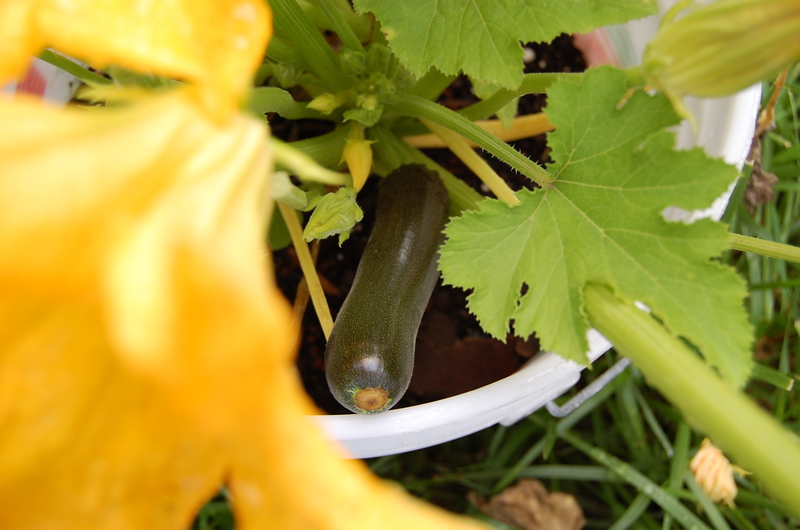 And no grocery store purchase is as exciting as this, my very first ever zucchini, was. I’ve tried to play it off by posting my weekly instagram pictures, but I’ve been moving. I’m all discombobulated, and most importantly, I’m trying to get used to a new kitchen. And taking pictures in a new kitchen. Whoa. This weekend, I retrieved all my furniture from my parents and I am officially at home here in Carrboro. I’m blogging from my (hopefully) fully-assembled desk while Jason washes the dishes from dinner. The best thing about the new place? (Besides the chickens?) My new table. It was a christmas gift from my dad. It originally came from the Fort Macon Hotel in downtown Morehead City, which my great-grandfather, H.B. Spears, owned in the 1950s. After the hotel closed, the table was passed down to Nanny and Pop, my grandmother and grandfather. There, it became a part of the kitchen, and the lives, of the Conner women. It would have served as a kitchen table for Nanny, where she and her mother, Maw-Maw, my great-grandmother, would have spent countless hours together. The table was eventually passed down to my uncle Dickie, and it ended up in his storage unit. It was nothing but legs, and my dad grabbed it and kept it, rolled up, in his workshop for the last ten years. He pulled it out not long ago. 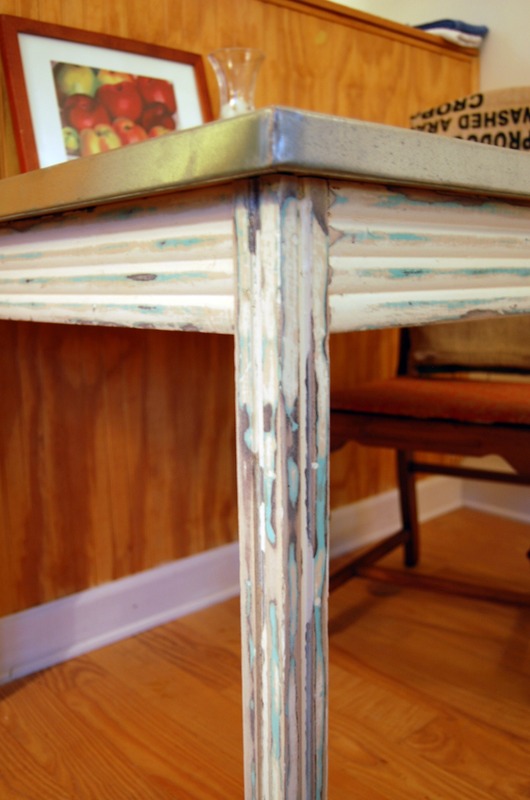 He attached a top made of galvanized metal and distressed the legs and frame so that you can see all the colors the table has been painted. 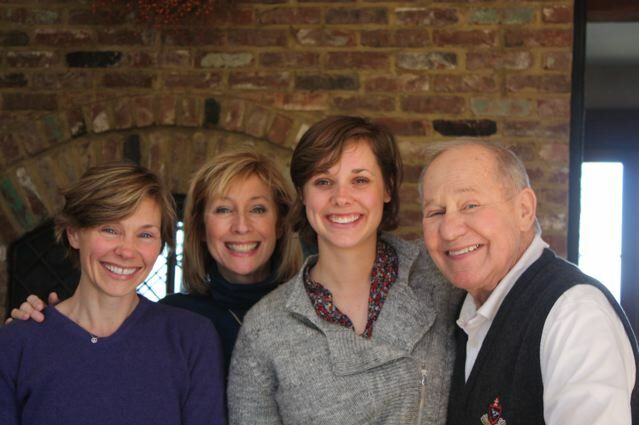 According to my dad, “those Conner women loved to paint things.” I learned a lot from those Conner women. Nanny was a strong-willed, stubborn, intelligent, and loving woman. She was sick the whole time I knew her, but she never let me know it. She loved me with the same sort of ferocity that she did everything else. Even though she died ten years ago when I was only twelve, she’s just one of those people whose personality was big and powerful enough that she is still a presence in my family. 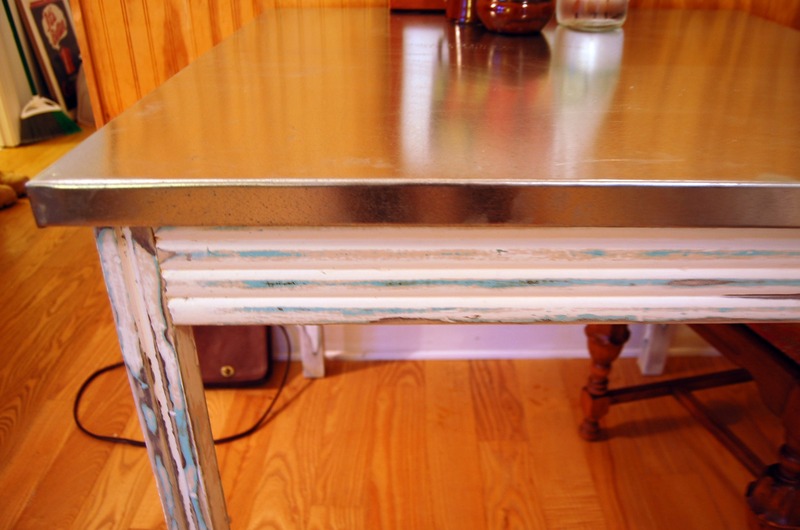 I look at this table, and I see her, young and healthy, rolling out biscuits. Maw-Maw probably also sat and drank coffee at this table. Another of the Conner women, Maw-Maw was mother to six children, grandmother to eighteen, great-grandmother to forty-one, and great-great grandmother to eight. She died last month at ninety seven. When I knew her, Maw-Maw was a caretaker to everyone she came in contact with. She was kind; kind in a way that defines the word. Jason and I ate dinner at this table for the first time tonight. He made baked chicken with paprika, and I made some macaroni and cheese and green beans. 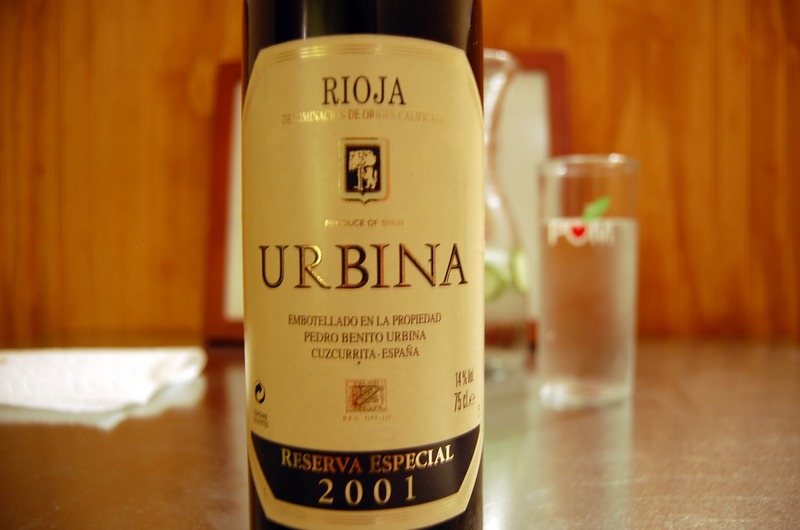 We opened a bottle of wine that he brought home from Spain last year to celebrate. The chicken was great, I should leave the cooking to Jason more often. He makes big messes, but he always cleans up and the results are always delicious. I’m looking forward to drinking my coffee at this table. If I ever learn to play bridge, I’ll do it at this table like Nanny and Maw-Maw did. I may even roll out the occasional biscuit. I came from those Conner women who loved to paint things, and many others. The kitchen is a big part of my life, and the kitchen table is a natural part of that. I really like the idea of living my life where Maw-Maw and Nanny lived theirs before me.